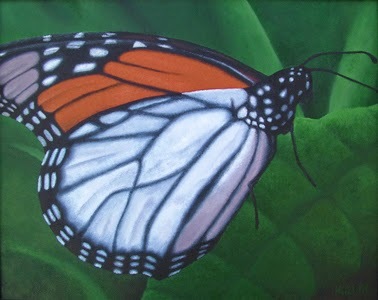 Monarch is a Monarch butterfly sitting on a green leaf. Butterflies are a symbol of transcendence. The 16″x20″ original Liquitex acrylic painting on 3/4″ wrapped canvas is spray varnished. It includes Certificate of Authenticity and frame. The painting took me approximately 16 hours to complete. I finished it in 2006, under my birth name.